The integrity of business systems and their data are critical to enterprises of all sizes. Each minute of lost data availability or compromised information integrity translates directly to unrecoverable revenue, and interruptions in information flow that may take a serious toll on the very heart of your business. StoneFly Replicator® CDP is an integrated data recovery solution that replicates not only files, but also databases and entire applications. 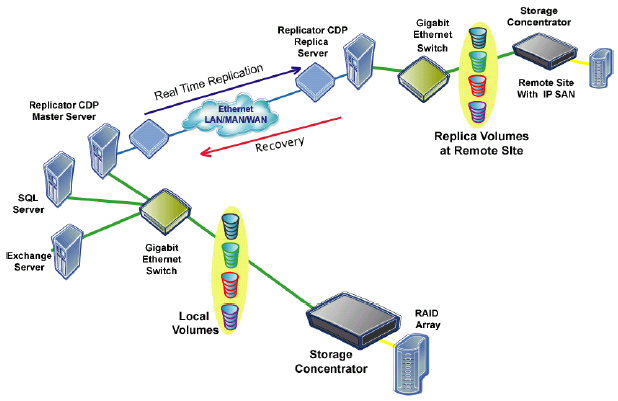 It is ideal for meeting data recovery point objectives (RPO). An advanced Rewind technology provides a comprehensive undo capability that allows system administrators to instantly roll back damaged data resources to a previous, valid state. Because the Rewind is application aware, it can rollback transaction by transaction until the exact point of data loss. Regardless of the type and severity of the challenge your information infrastructure may face, StoneFly Replicator CDP can ensure data integrity. StoneFly Replicator CDP seamlessly replicates data from a master server across the WAN to a replicate server. Seamless Recovery: Recovering from data loss or corruption is effortless and practically immediate. Entire databases, along with open files and system settings are synchronized, ensuring that every bit of information, up to the moment catastrophe strikes, is backed up and ready to serve again. 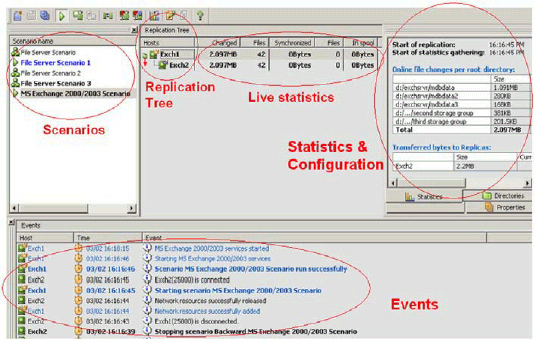 StoneFly Replicator CDP maintains fully functional replicas of file, database and complete application servers with real-time replication carried out over the WAN. Should a server fall prey to unexpected failure, its synchronized counterpart may be brought on-line to maintain high data availability, and users will have continued access to information resources. No information system is impervious to unexpected disaster. Whether natural misfortune or malicious attack, your business may find itself instantaneously deprived of its critical information. StoneFly Replicator CDP provides continuous data protection, allowing quick and easy data recovery from any catastrophe. Taking a server off-line to have its hardware or operating system software upgraded, and moving or changing network configurations doesn’t have to mean downtime. StoneFly Replicator CDP temporarily replaces servers during migration or maintenance activities, ensuring uninterrupted data availability. StoneFly Replicator CDP may be used to provide complete corporate information repositories distributed and synchronized across multiple servers. Employees and representatives in the field will benefit from optimized, local access to crucial corporate information. StoneFly Replicator CDP is controlled from a centralized management console via an HTML browser.